The continually growing group of cancer-patients in the Netherlands is faced with a suboptimal level of oncological care. There’s a growing need for order and quality care. This care can improved by grouping the expertise in twenty to thirty oncology centres throughout the Netherlands, says Sjoerd Rodenhuis, chief medical executive of the Dutch Cancer Institute NKI-AVL and oncologist at the related Antoni van Leeuwenhoek hospital in Amsterdam. Nowadays patients with a rare variety of cancer are treated at hospitals specialising in this kind of cancer. According to Rodenhuis the distinction between rare and common types of cancer should not be made. Each tumor is unique and thus should be treated as such. This project ‘Daydreaming During A Nightmare’ is about an oncology centre placed close to the bustle of a public transport terminal in Breda, the Netherlands. Within this area people go about their usual, everyday business; catching a train, transferring to a bus, buying a newspaper and so on. By merging this everyday context with expert cancer treatment interaction emerges between two worlds. These worlds are confronted with each other and become aware of the other’s reality. The reality of the cancer patient gets a spot within everyday life, hereby breaking the taboo that shrouds cancer. People can talk more openly about the disease and possibly patients will be treated less awkward. Taking away part of the anxiety can motivate people to get a check-up early on when first symptoms surface. Being early improves chances of healing. For this new, as yet unbuilt terminal area the city of Breda has created an urban development plan. This project tries to adhere to and respect this master plan as much as possible. Some changes are made to improve the actual design and area, most notably rounding the façade and marking the inner patch of grass as purposeful space. 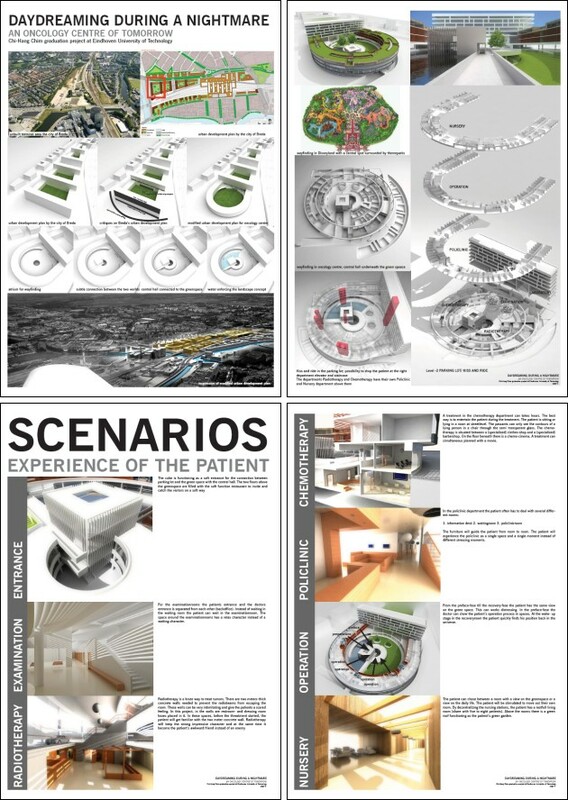 Experience of the cancer patient is at the core of this design, resulting in an approach that works from the small (patient) towards the larger structure (complete design). This approach to architecture tries evade the dictating role of architectural legislation concerning such care centres. The oncology centre design is divided into scenarios: 1. Entrance, 2. Examination, 3. Chemotherapy, 4. Radiotherapy, 5. Policlinic, 6. Surgery, 7. Nursery. These scenarios are studied and designed independently, without context, at a small and personal scale. For each scenario ideas are developed for the intended experience. The designs for the scenarios take into account positive factors of Evidence Based Design, user centred design and wayfinding research. When designing at a larger scale these scenarios are taken into account at an early stage. The scenarios form the constructs of the larger body that is the programmatic grouping and resulting architectonic form. The building at large consists of two main volumes; a central block surrounded by a ring. This block provides a strong point of entrance and recognition, while other functions reside in the ring and interact with the inner plaza and the life on the outside. The architectonic geometrical form seeks to provide order. It is this order that contrasts with the current state of Dutch cancer care and the lives of patients. And it is this new order that can fulfil a need of the patient.